To engage in a bible study, right here on-line, let us know the topic that you would like to study, by going to the comment section at the bottom of this page, and typing in your request, and I will get back to you as soon as I possibly can, so that we can set up and begin your study. An excellent study topic that we highly recommend, is “God’s Plan of Salvation”. There’s nothing, more important to each and every one of us, than knowing exactly how to be forgiven of our sins, and how to receive the promise of eternal life in heaven. But of course, you can choose any topic that you desire. If you don’t have a specific topic that you would like to study, we can guide you through a study of an overview of the entire bible, or an overview of either the Old Testament, or the New Testament. When you leave your requests, you will be asked for an email address for me to respond to. If you do not have an email, or if you do not wish to leave one, simply supply me with an alternative method of response, and I’ll get back to you ASAP. You can leave your questions and comments at the bottom of any page, but this page is devoted specifically for that purpose. This website is built around the format of answering the questions that you might have regarding the bible, or about God Himself, or the church, or any spiritual question at all. And as always, we will go directly to God’s word for the answers. It’s never our own thoughts that matter when it comes to the correct answer to any spiritual question, but rather, it is “God’s Word” alone that matter. Have you ever heard the saying, ‘It’s my way or the highway”? 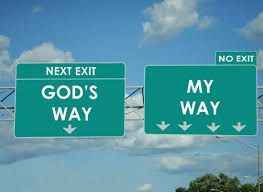 Well in reality, “It’s God’s way or NO way”. Feel free to ask any question at all, and we will be diligent to provide you with the bible answer as quickly as possible. 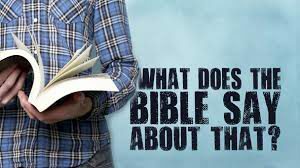 You can ask either a general, or specific question regarding any biblical topic, and I will respond to you ASAP, so that we can study the subject further, in as much depth as you desire. 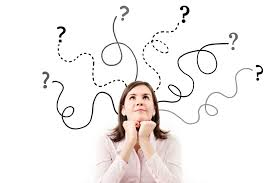 If you don’t have a specific question, but would like to pursue a study on a specific topic, please let me know what that topic is, and we can engage in that study. Thanks for your interest in God’s word. I’m never really a religious person, I follow whatever my parents do i.e. Taoism / Buddhism. At the end of the I believe there is only one God, it’s just people call Him differently. Recently I got to know a friend who is a Christian, she invited me to join her at the Sunday mass and I did. I’m not a Christian (not baptist or something like that) BUT there was a time couple of months ago I was in dire need of something, I asked for it in my prayer to Jesus Christ (may sound weird that I did but again, I believe God loves all human beings regardless of their color or beliefs) and amazingly my prayer was answered and this is just one of a few times that miracles happen! Questions is, whenever I prayed for something to happen, do I have to repeatedly pray for the same thing for it to happen? Like saying it in my prayer every night? I think the Bible has embedded deep meaning that sometimes modern living is unable to comprehend, message got distorted. I’m following Pastor Joseph Prince’s (Singapore) preaching and I’d glad he’s a very open person in interpreting the bible. Hi Jennifer, I’m glad that you visited and left your comments and a question. Let me first say that I agree 100% with a couple statements that you made. First, there is ONE God! The bible is explicit about that (James 2:19) Second, Different cultures do indeed have different names for God, but they still believe in ONE supreme God. Third, God does truly love all human beings! In God’s eyes, there is no color or national origin difference at all! As a matter of fact, the bible says again, explicitly, “There is neither Jew or Greek, bond or free, male or female, you are all ONE in Christ Jesus. (Galatians 3:28). Here’s another thing that I see with the majority of religious people. Most people do follow the beliefs and practices of their parents. When people are brought up with a certain belief, they tend to hang on to that belief. But, the bible does illustrate just as clearly as anything, that we all must make our own decisions, pertaining to what we believe and practice. For instance, the following words of Jesus were recorded in Mathew 19:29, Mark 10:29, and also Luke 18:29… “Truly I say to you, there is no one who has left house, or brothers or sisters, or mother or father, or children, or lands, for MY sake, and for the gospel’s sake, who will fail to receive a hundred times as much now in this present age.. and in the age to come, eternal life.” So in other words, what we’ve been raised to believe isn’t always what God has said to believe and to do. Sometimes we must “leave” our families beliefs, and sometimes even our families themselves if necessary, to stand for the truth of God. But we WILL be rewarded for it, if it were to ever come to that. I didn’t know that a belief in Taoism or Buddhism would advocate the belief in Jesus Christ, and the praying to Jesus. Is that true, do those beliefs ascribe to the belief in Jesus? I’m very curious, would you let me know? I would be very happy to talk to you some more on these subjects. Thanks again Jennifer. I’ll look forward to your reply, Jim. I had to do a quick addition to my reply here. I just looked up “pastor” Joseph Prince, and I see that he identifies as a Christian, but I don’t know his beliefs, and I don’t know that he is a true “pastor” in the bible sense of the word. So how does Christianity, shall we say, “blend” with Taoism or Buddhism? How could that be when to my knowledge, neither of those religions accept Jesus Christ as the Son of God, and the Savior of the world? Religion is a difficult subject for me. I guess, not so much difficult, but not popular with me. Let’ me explain. I am a PK (preacher’s daughter) and I am Christian and love God. When I was in my early twenties I spend a lot of time wanting to figure out my purpose and find my way. I went through some family tragedies and was sad to find that many of the people from our church were judgmental rather than loving and supportive. Long story short, I decided to leave the church but I never lost faith in God. I just didn’t want the politics that religion had. Now, I have a special relationship with God. I meditate often and I also pray. When I pray, It is more about me talking to him. But when I meditate, it is about me being silent. This is when he speaks to me. It is a very spiritual thing. I am a very spiritual person, but not religious. Hi Wendy, thank you for visiting the site and for your comments. I hope you will consider my remarks here, and accept them with the same love that they are given. It’s unfortunate that you experienced some people who were too judgmental. That’s always a hindrance to Christianity. But here are some truths about God and His church and religion. You are religious but simply don’t realize it. You see religion simply means your beliefs about a higher power and how you respond to those beliefs. And so religion means how we feel and act towards what we perceive as a god. In reality there is only one God, and that’s the God of the bible. You see, the bible actually IS the very word of God. And the bible is what God has chosen to use, to talk to us. God does not talk to us through our thoughts. So when you meditate, and think about God, that is not God speaking to you, that is simply how you perceive God in your mind. That’s why almost everyone has a different view of God, because they all perceive Him differently in their minds. But the true knowledge of God comes from His word. God tells us that He has spoken to man in different ways throughout history (Heb 1:1), but He says plainly in Hebrews 1:2, “In these last days, He has spoken to us in His Son..” So God has spoken to us through the words of Christ, and these words are preserved for us to read and to hear, in the bible. But in saying that He HAS spoken to us in his Son, that rules out any other way of speaking to us. That’s the way God has chosen to speak to us, it’s that simple. Our relationship with God is either a relationship of obedience to His word, or it is one of disobedience to His word. If we don’t know His word we can’t obey it, and thus we have a relationship of disobedience. Everyone has a relationship with God, it’s just a matter of what kind of relationship we choose to have. Please let me know how you feel about all these things. I would love to study the bible with you, so we can hear God speaking to us, and know His word. Please let me know if we can study. Thanks and may God bless you, Jim. With so much hate in the world such as child abuse, terrorism, and disease, how can turning to God help a person live in this world? Hi Suzanne, thanks for your question. The fact that there is so much hate in the world is what makes a lot of people question whether there actually IS a God. They wonder why He allows all this to happen. But of course all the hate is man’s doing. God has given us all free choice in our lives, and many choose to hate and to do evil things. But God’s main concern is with our spiritual life. And of course we have free will to choose in that area as well. God has given us many wonderful promises for the life to come if we will be faithful to Him during this life. God has promised a life that is free of pain, and sorrow, and sickness, and dying. All of these things pertain to this life only, and this life is “but a vapor that appears for a little while, and then vanishes away.” James 4:14. If we live now, in obedience to God’s word, then He promises us a life with Him where there won’t even be any remembrance of the bad things of this life. The fact that this life is filled with so much evil and hate, is exactly WHY we should seek refuge from God. God has made promises that are only for His children. And we are His children if we obey His commandments. So turning to God is really the only refuge we have in this life, and it’s the guarantee of an eternal life where there will not BE any of these evil things. Here’s an example of how God wants you to look at this life.. This is from John 16:20-22, “Truly I say to you, that you will weep and lament, but the world will rejoice, but your sorrow will be turned to joy.” Now there’s more to these verses but let me explain this first. If you love goodness and peace, then in this life you will weep and lament, but the world, which seeks to satisfy itself at the expense of others, will rejoice. But Jesus is saying that a time is coming when your sorrow will be turned to joy. Now here’s the rest of those verses.. “Whenever a woman is in travail, she has sorrow because her hour has come, but when she gives birth to the child, she remembers the anguish no more, for the joy that a child has been born into the world. Therefore you too now have sorrow, but I will see you again, and your heart will rejoice. and no one will take your joy from you.” Do you see what the Lord is saying? In this life there will be sorrow because of the evil that man (the world) has created, but in heaven, you will remember it no more, and no one can take your joy away. What comforting words, and what a comforting promise from God. Turning to God is the ONLY way to cope with this world. May God bless you in your search for His blessings. Please keep reading Bible answers to Spiritual questions, and you will learn how to have these precious promises to comfort you now and forever more. Please allow me to help with any other spiritual questions you may have. Hey Jim, i’ve been struggling with spirituality for a while now. I find it difficult to believe in God if he knows my past present and future and yet would still create me if I was destined to go to hell. How would you explain this? Hello Ryan. Why would you think that anyone is destined to go to hell? Did someone tell you that? No one is destined for anything. We all are free to make our own choices in our lives. That’s one thing that God’s word tells us from beginning to end. We all make wrong choices sometimes, but as long as we are alive, there is time to turn from our wrong choices and start making the right choices. We may at times have to live with consequences of our past actions here in this life, but As far as one’s spiritual life is concerned, God is always willing to completely forgive if we will simply choose to obey His word. Some people have a difficult time with accepting the fact that God allows sickness and disease to exist. And that He allows people who do evil things to go on living that way, and even to seemingly prosper. But we must be able to see the bigger picture. This life is but a vapor in God’s eyes. Eternity is what we must focus on. The purpose for this life is to prepare ourselves for eternity. But we need to make the right choices, and the choice is always ours. If we learn God’s word, and obey what it says, we will have nothing but eternal bliss waiting for us. We have all been created to live with God eternally, but many people choose not to. Tell me what specifically I can help with. I can truly point out scriptures to you that deal with any problem you may be having. All you have to do is trust God’s word. You can even contact me privately if you wish, by the email address given of the phone number given. Let me know please. Jim. Good morning Jim, I sure love our website!! check out my friend Ron’s website and let me know what you think. http://www.chimneyscriptures.com. Thanks Terry. Did you see that I’ve made some changes? I went to Ron’s site once before, but I will go again and look at it. I have a question. Does the bible tell us why God has created us. what is our purpose here on earth. Isn’t this something that everyone struggles with? Thanks for your question. Yes, the bible does tell us why God has created us, and it tells us what God wants us to do with our lives. And yes again, you are right, this is a question that many, many people seem to struggle with. But the bible is very clear about why we are here. You see, the problem is, that most people don’t look to the BIBLE to find the answer. They look to the world around us. But the world does not have the answer, God has the answer. I will do a “Post” that shows exactly what the bible says about man’s purpose. I hope you will look for the post coming in a couple days. Thanks again for your question. I’m the type of person that wants to understand people better. Religion for people is a really big rooted thing. For as long as there’s been people there has been the belief of god or gods. For you, what brought you to your particular belief? Was it something you were taught? Or something you found? Are there distinct reasons you find this to be true? Or is your acknowledgement of this higher power more faith based? In other words, when you look around at the world, and all that has been created, it is so obvious that there is a God who created all of this, that there is no excuse for denying His existence. I believe in the God of the bible because of all that exists, and because His word is so far above any man’s words. But then I guess you have to really study His word to understand that. The bible does say that “we walk by faith and not by sight”, but there is so much evidence of God, that no other explanation of the world makes any sense at all. I hope I have given you some things to think about. I would be very happy if you would study the bible with me. We could study on-line like this. There is a spiritual life that remains when this physical life is over. We all need to prepare ourselves for that spiritual eternity. Let me know if I can help you. Thanks for your comments, Jim.